I love that e-Card. It was sent to me by one of my second grade teaching friends. I've been accused of crazy before, especially in relation to teaching Kindergarten. But I've never understood why it seems so daunting to others. Teaching Kindergarten is always a pleasure. The challenge to meet their needs, the fun because you never know what will come out of their mouths. Kindergartener's are awesome for your self-esteem because Kindergarten kids don't care if you sing on tune, they always like your clothes and shoes, and if you play an instrument, they will think you are the most talented person who ever existed! When you've been teaching long enough, you begin to realize something. Each class is it's own organic creation. Each class is special and unique. Now I know that each child is unique and has their own personality, but those personalities work together to give each class a group personality. One year I felt like I was white knuckling it through the entire year. I had 2 boys diagnosed with Autism that year, and a little girl with "developmental delays" (a classic case of Fetal Alcohol Syndrome if you ask me). Then there was the class with lots of "energy", you never knew what would happen from one day to the next. One year I had "that class". You know the one, the kind that has 'behaviour issues'? Took a lot of understanding and deep breaths to make it through each day. And then last year I had a class of comedians. They were hilarious and cracked me up every day, lots of one liners were thrown around. We had a lot of fun. This year is no different. If I were to classify this class, though, I'd say we are young, we are curious, and we are used to speaking our minds. Have you ever read Junie B. Jones? My own kids used to love reading those books. I remember thinking having a Junie B. in my class would be lots of fun. Little did I know that, this year, the class personality could be described as "Junie B." And let me tell you, it's exhausting. Fun! But exhausting. Sometimes when you share little happenings during your day with others they say, "You should write these down!" So I thought, why not share them on my little blog. They are pretty funny, and they do say a lot about what it's like to teach Kindergarten. Principal (on the announcements): Boys and girls, I know that many of you saw the fox watching as you came in to school today. Remember, if you are outside at recess and the fox comes over, just walk over to a teacher and tell them. Me: yes, just tell a teacher. Remember, foxes aren't pets, they're wild animals. Student 1: my nana feeds the foxes. Student 2: foxes are carnivores, just like dinosaurs were. I'm an expert on foxes. Student 3: carnivores eat meat. Student 4: humans are meat! Student 1: humans are NOT meat! Me: well, yeah we are. But foxes won't eat you. Student 5: then why can't we pet them. Me: because they are wild animals, I told you that. They aren't trained like your pets, you don't know how they will react. Student 6: they might bite you, or try to eat you. Me: they won't eat you. Student 7: last night I went for a ride in a buggy pulled by donkeys. We've all been there, right? In the middle of one conversation and then a student contributes something random that has nothing to do with what you were talking about (and I can guarantee that student 7 did not go on a buggy ride pulled by donkeys). Me to a student at the end of the day: You need to finish getting ready. Everyone else is, and we need to get to the busses. Me: Why are you crying? Student: No one gets me! Me: What do you mean "No one gets me"? Do you mean they don't understand you? Me: OK, does that mean they don't understand your words, or they don't understand who you are as a person? Student: They don't understand me as a person! Student: I CAN GET READY FAST! Teaching Kindergarten means you are always "on". Your brain is functioning at 100% from the time you get there until the time you leave. There are some perks though. You get lots of love and hugs, they are always excited on Monday mornings, and they love to laugh. If you have a bad day, you generally get a do-over the next day, because they really don't carry grudges (just don't take advantage of this feature, because eventually it stops). Other teachers always say they think the kids are cute, but they'd never want the job. 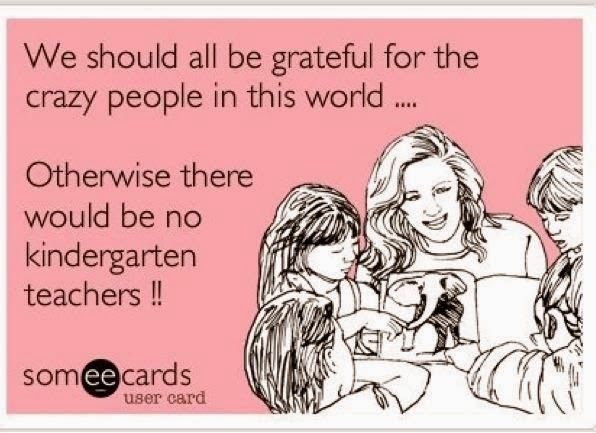 Kindergarten teachers are usually the opposite. Older kids are great, but teaching Kindergarten is where it's at. I guess we are our own special breed. I'm glad to be a part of it! I teach kindergarten, which explains a lot about me. Life is an adventure and 5 year olds know how to live it best!